While gracing their newest car with the front of a P1 and the back of an 12C might feel like a lazy move, the McLaren 650S Coupe and Spider will hit the road with 641 horsepower, giving it a top speed of 207 mph and a 0-60 time under 3 seconds. 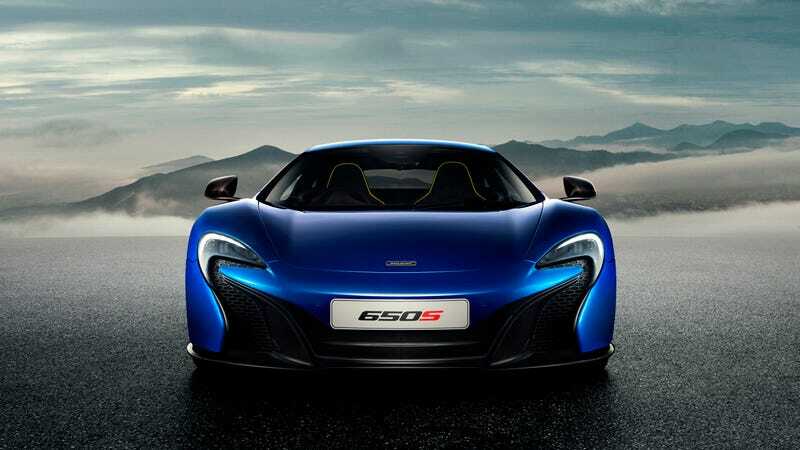 If the McLaren 12C is not fast enough but you couldn't get one of the 375 (already sold out) P1s, the 650S is your car. And while it might look like a normal MP4-12C from the rear, don't be fooled by the shapes alone. There's a lot of new tech under that carbon fiber. About 25% to be exact. Available as a fixed-head coupe or as a Spider with the well-known retractable folding hard top from as early as this spring, the 650S gets 641 horses from the 3.8 twin-turbo V8 thanks to a different head and pistons. That gives it a 0-125 mph time of 8.4 seconds while also being much faster in the corners. Even though it boasts the same drag coefficient figure as the 12C, it's using the air more efficiently. The airbrake now deploys whenever the car senses extra downforce is advisable rather than simply under braking or when manually operated. The 650S also has a rear diffuser similar to the 12C GT3's. All this results in 24% more downforce than in the 12C at 150 mph. How Special Does A $500,000 McLaren GT3 Racecar Make You Feel? Ride hight and handling modes are also independent from the drivetrain settings, giving the drivers more settings to choose from. The seven-speed dual clutch transmission changes even quicker than before, while the unique five-spoke lightweight forged wheels are fitted with Pirelli P Zero Corsas as usual from McLaren. With all that performance aimed against Ferraris, the 650S still remains a comfortable road car. McLaren's active chassis control is the smartest of them all. The 650S also has an Alcantara interior with satellite navigation, Bluetooth telephony, DAB digital radio (satellite radio in North America), wireless tethering, audio streaming and voice control as standard. The P1's fixed carbon bucket seats are optional.